In this post, I discuss how veganism relates to energy efficiency, evaluate a few specific livestock common in the U.S., and conclude that factory farming techniques are significantly wasteful of food energy. In closing, I suggest some ideas for how people can adjust their diets to be more environmentally sustainable, especially if they are not interested in veganism. 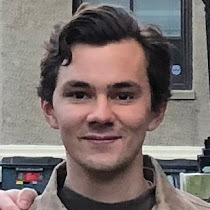 My brother adopted veganism about a year prior, and convinced me that the diet could be as healthy, or healthier, compared to an omnivorous diet, overturning my misconception that vegans were inherently nutritionally deficient. A growing body of informal and academic work supports the idea that veganism is more environmentally sustainable that omnivorism. Now about 1.5 years later, I've noticed many benefits: increased speed, stamina, energy, and near-elimination of common colds. 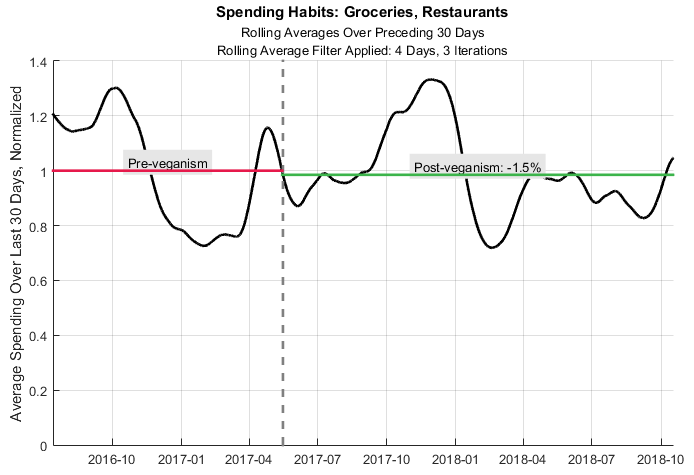 Contrary to popular misconceptions, my food spending has decreased slightly (despite inflation), and I've naturally maintained my pre-veganism weight while becoming leaner and more muscular with increased exercise. "Eating lower down on the food chain provides a massive savings in terms of how much energy and resources you need. If you're on the third trophic level and you eat herbivores, the animals you eat contain only 10 percent of the energy originally stored by the plants they consumed...[In] general, eating lower on the food chain is always a more efficient practice." source: Sciencing: "How Does Being a Vegetarian Conserve Overall Energy in Trophic Levels?" "It takes more than 2,400 gallons of water to produce 1 pound of meat; 1 pound of wheat takes 25 gallons." source: HumaneFacts: "Environmental Impact of Raising Animals for Food"
Maybe so, but pound-for-pound, meat is much more nutritious and energetic (i.e. higher in calories) than wheat, so maybe the additional water is a good investment? From this statistic alone there's not enough information to make a meaningful conclusion. Unsatisfied with writing on veganism, I sought to develop my own metric: a litmus test to gauge the efficacy of veganism in improving environmental sustainability. The food chain starts with plants, and consequently all other trophic levels depend on plants. Growing plants is non-negotiable. So in effect, a referendum on veganism is a referendum on livestock cultivation. Should we do it, or not? In an abstract sense, livestock can be viewed as energy conversion machines that convert plant products like corn and hay to animal products like meat and eggs. The figure of merit for an energy conversion machine is its efficiency - that is, its output divided by its input. The outputs are straightforward - meat, milk, and eggs. The inputs are the animal's diet - typically, some combination of corn, grains, legumes, and forages (i.e. grass, hay, stovers, etc). This was my starting point that I refined as I learned more about the modern food supply system. To clarify a perceived gap: pro-vegan sources usually ignore the fact that livestock are significant consumers of agricultural waste with digestive systems that are fundamentally different from humans', thereby underestimating their practical efficiency. To reduce the problem to its most essential form: energy is arguably the most fundamental agricultural resource, as it can be traded for water (e.g. through desalination), land (e.g. through terracing), carbon emissions (e.g. through sequestration), or pollution cleanup. All energy transfers are less than 100% efficient, so eliminating unnecessary intermediate trophic levels, and their associated energy transfers, increases overall energy efficiency. Cultivating the world's staple crops like wheat, corn, beans, and rice produces a great deal of agricultural waste that humans can't digest, but are readily digested by ruminant livestock. As there are no intermediate trophic levels between livestock and forages, and no other uses for forages, it seems reasonable that they be fed for livestock. However, in the factory farming model which dominates U.S. agriculture, forages are a secondary food source for modern livestock, with the primary food source being, most typically in the U.S., corn. These reasons for this are complex, but include heavy tax subsidies for corn, high meat demand, and consumer preference for marbling in meat. Further, non-ruminant livestock consume no forages at all. By design, RUEI has some useful properties: it's a dimensionless percentage, enabling direct comparison of disparate livestock and diets, and it's meaningfully signed: positive RUEI indicates a net gain, and negative RUEI a net loss. Unlike thermodynamic efficiency, which is always 0-100%, RUEI can be negative or exceed 100%, since it is not an efficiency but rather a normalized return. 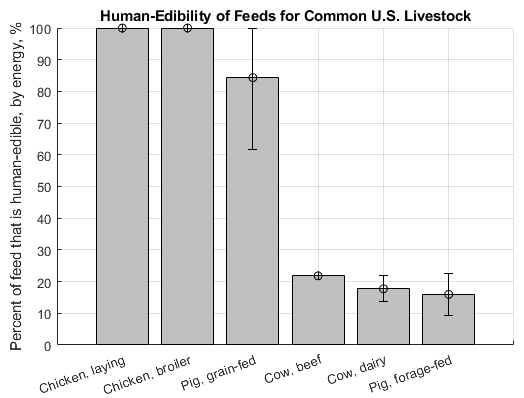 To limit scope, I restricted my analysis to three animals with sufficient data available and that are of primary importance in the U.S.: cows, pigs, and chickens. Cows breeds are specialized for either milk or beef production. Both cases are analyzed below. source: Dairy Carrie: "What Do Cows Eat"
source: Slow Money Farm: "What Do Cows Eat"
Data on specific beef cow diets proved difficult to find, so I re-used the diet information for the dairy cows. Beef cows produce no milk and yield a similar amount of meat, though their lives are much shorter at around 18 months. source: Niche Pork Production: "Example Pig Diets"
"Example [diet] including cooked, full-fat soybeans"
"High-forage diet for gestating sows"
This is the only diet found to have a positive RUEI, owing to it being based on forages. Feed varies significantly between farms, and it's unclear how common this type of feed is, but it does suggest an interesting gray area that will be discussed further. Like cows, chickens breeds are specialized for either egg or meat production, with the latter termed "broilers". A laying chicken typically lives to be 18 months old and produces around 170 eggs, being slaughtered at a weight of around 2.2 kg, with a dressing percentage of around 70%. Broilers live to be about 1.5 months old, and are slaughtered at around 2.0 kg, though some broilers can reach as much as twice this weight. Both types of birds eat about 5% of their weight daily in the form of corn and soybeans. Chickens are not significant consumers of agricultural waste products. source: Poultry Science: "Energy and nutrient utilization of broiler chickens..."
A chicken's egg production constitutes the majority of its food output, about 73%. 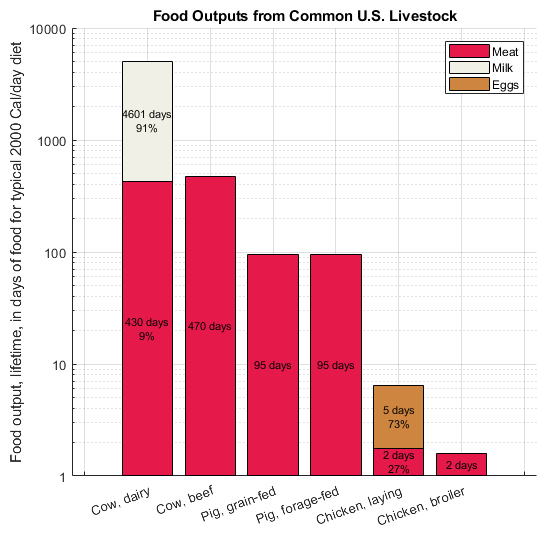 This figure shows the food outputs of the livestock analyzed, broken down by the output type in terms of days of food, assuming a typical 2,000 calorie/day diet. Incredibly, a single dairy cow produces enough milk in its brief life for about a decade's worth of human caloric intake. Feed varies significantly by livestock, farm size, and geographic region, and is also usually proprietary, so these figures cannot be precise. Nevertheless, they capture some important trends about the extent to which livestock are recyclers or consumers of food products. 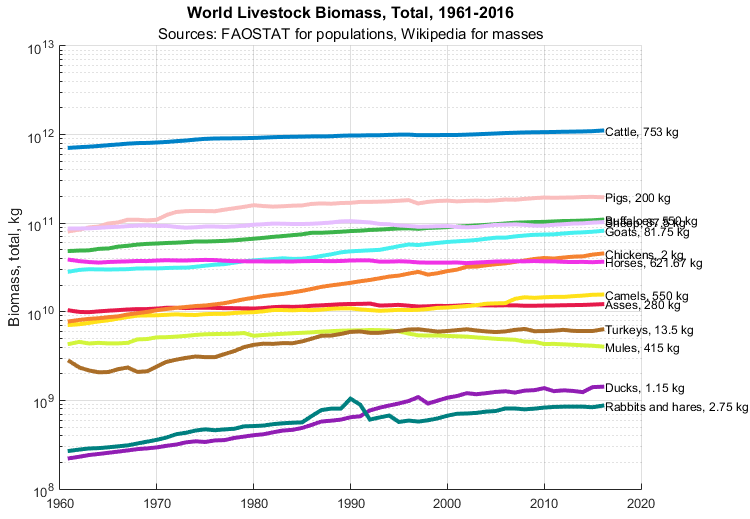 All of these livestock originally existed near 100% on this chart, consuming mostly scraps and forages, but modern farming techniques have dramatically pushed the numbers lower by replacing large portions of feed with grains and legumes. RUEI was negative for all livestock analyzed except forage-fed pigs, which consume mostly alfalfa hay or corn stovers. The other livestock shown could also be raised in a positive-RUEI manner, but this is at odds with current factory farming and consumption habits. The data supports the view that factory farming, with its livestock feed characterized by low forage and high human-edible feed, is environmentally unsustainable, or at minimum, energetically wasteful. Mainstream methods for cultivation of cows, pigs, and chickens in America cause a net useful energy loss, even when considering the fact that some animals consume agricultural waste that is human-inedible. However, an interesting gray area is found in the case of high-forage diets characteristic of free-range agriculture. 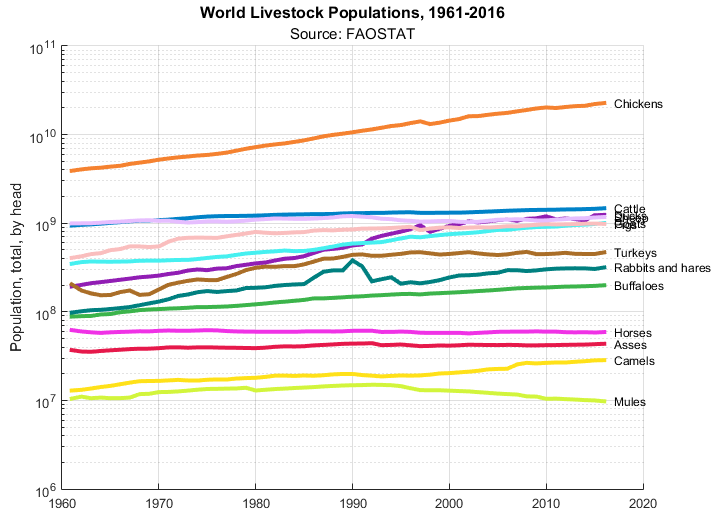 Further, within this framework, livestock that consume human-inedible/waste products exclusively would have an infinitely high RUEI. Interestingly, this aligns with the pre-industrial model of farming, before factory farming, when crop cultivation was the primary focus and livestock existed in a secondary capacity, grazing freely, consuming occasional food waste, and in some cases serving as labor. In these times, meat was rare and weighty, a far cry from its commodity status in modern America. We are unlikely to ever return to this idyllic past, but we would be well-served to learn from its wisdom. Those who are not prepared to give up meat should at least better understand its environmental impact and reduce consumption, while opting for local, free-range, forage-fed options whenever possible. Veganism is too extreme for most people, but that's okay. In practice, it's far more beneficial, and socially conscientious, to reduce livestock consumption and/or improve cultivation standards than trying to convert non-vegans, which is usually a losing battle and risks stigmatizing the movement. For example, reducing the meat consumption of 10 people by 10% is far better and easier than reducing the meat consumption of 1 person by 100%, since the ask is more reasonable while the impact is equal yet more socially broad. Purism should not stand in the way of pragmatism. Those interested in the data, calculations, and sources may view my full spreadsheet, the basis of this post. I welcome any corrections and criticisms. Books that shaped my general thinking on this topic are "Who Will Feed China?" by Lester R. Brown and "America's Food" by Harvey Blatt. 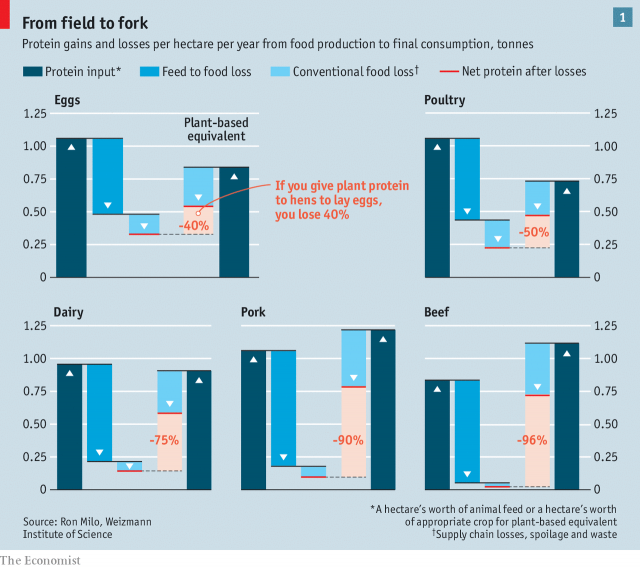 The Economist ran an article last week called "Why people in rich countries are eating more vegan food", which includes a nice graph showing "feed to food loss" for various livestock. 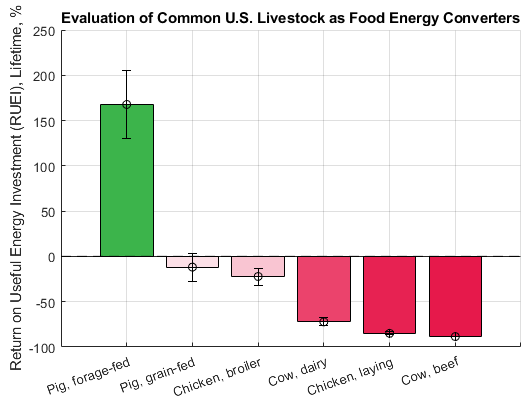 They use protein as their intermediate quantity to compare between crops and livestock instead of energy as I've done here, but the concept and conclusions are similar.